The beloved chicken chain is expanding its nationwide delivery service through DoorDash. Say hello to free chicken and goodbye to waiting in those two-lane lines at Chick-fil-A. Well, at least if you live within 10 minutes of one of the 1,100 restaurants participating in its new delivery service. That's right, America's favorite fast food restaurant is about to become even more convenient. And for those who have been deterred by overwhelmingly large lunchtime crowds fending for some Spicy Chick-N Strips, worry no more. 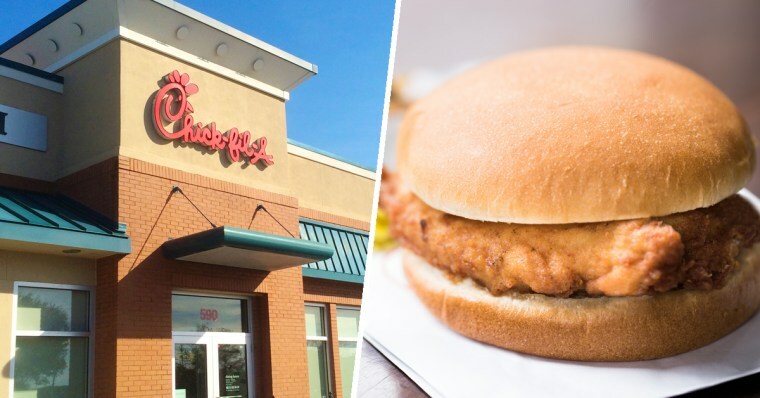 On Tuesday, Chick-fil-A announced a new partnership with the delivery service DoorDash to get all the chicken and fries that customers crave delivered directly to their homes or offices. To celebrate the new offering, franchise locations in participating cities will be offering one free chicken sandwich per customer (up to 200,000 total) starting Tuesday, Nov. 13 through Nov. 20. Interested? Just place an order for $5 or more anytime after 10:30 a.m. through the DoorDash app or website and use the promo code: "CFADELIVERY." Chick-fil-A will only show up as a restaurant to order from in the cities that currently offer the service. Of course, Chick-fil-A isn't the only major chain sourcing delivery services to get hot food to more customers. Burger King also partnered with DoorDash recently, and is promoting the service with a series of ads featuring real-life drive-thru accidents. Delivery isn't the only thing Chick-fil-A is doing to speed up its service. The chain recently launched another enhanced restaurant item: Call buttons for easy, table-side service. Plus, in October, the chicken chain announced the opening of two delivery- and catering-focused prototypes in Nashville, Tennessee and Louisville, Kentucky. The locations are cash free and don't have dine-in areas or drive-thrus. The lack of a dining room is offset by the locations' oversized kitchens, fit to fill plenty of to-go orders in the busy city centers. Since Chick-fil-A first launched its test delivery program last year, it discovered one pretty surprising thing about its customers: It wasn't a chicken items that was included in most orders, but its popular waffle fries.